Don’t tell anyone, but I think some of the easier houseplants to grow inside are orchids. This is one starting to bloom in my sun room now. It is “Lava Burst” and I’ve had it for several years. From what I can recall, it blooms every 6 months or so. And I don’t do anything special to get it to bloom. Why are the orchids easier? Well first off, I can neglect watering and they seem to be fine with that. I don’t water them every week. I water them once every 10 to 14 days or so. I think they actually prefer to dry out a bit between watering. They also don’t seem to be quite as susceptible to insects, at least not in my sunroom. I have written before that I have a bit of a mealybug problem in my sunroom. Those little cottony masses of tiny, furry insects are driving me crazy trying to control them on aloe, African violets, and Kaffir Lilies. But the orchids? For whatever reason, I’m not finding any mealybugs on them, or the night blooming cereus. I guess I am fortunate in that regard because I think the mealybugs could easily infest the orchids. I think one reason they don’t is most of the time I water the orchids in a sink and give the leaves a good washing off at the same time. I honestly give my orchids no special attention. Though I’ve read some books on orchid care where they discuss at great length the optimal temperatures and light conditions for different genus of orchids, I don’t pay much attention to them. I have no means to provide any special environmental conditions. The orchids just have to make a go of it in the sunroom, which tends to be a few degrees cooler than the rest of the house in the winter, and just a few degrees warmer than the rest of the house in the summer. And the orchids are all pretty much sitting by a north window, but get some light from the east and west windows throughout the day. Perhaps this lack of attention to specific details keeps some of the orchids from reliably blooming, but that just makes it all the more exciting when they do bloom! I know people can go crazy over orchids and go to great lengths in terms of time and money to find new orchids or breed orchids. I have just a few orchids, acquired here and there along the way, so I haven’t gone crazy with them. But if you decide to try an orchid or two, you should know that some people just really connect with these mysterious plants, succumbing to a condition known as “orchid fever” and it could take over your life. 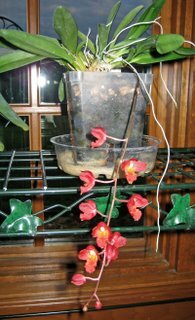 But, in spite of this risk, if you are one of those gardeners who hasn’t done well with houseplants, give orchids a try! 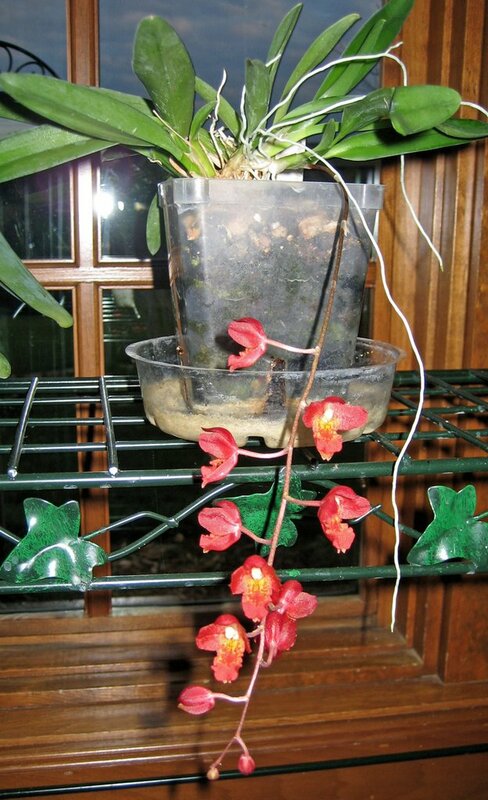 Your Orchid has a heavy red colour! I have no luck with them, but my neighbour, she has the whole window full up with them. I've never even tried to grow orchids, because I believed they were much too fussy to bother with. After reading this however, I think I'll try some! I gave away all my orchids along with the other 150+ plants I had in my house when I left Washington state last winter. It's a good thing too - they would have gone the way of the amaryllis in the trailer as we drove across the country.